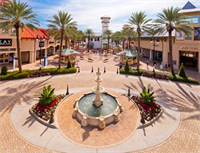 Celebrating 15 years as the Emerald Coast’s best outdoor shopping center, Destin Commons boasts 95+ stores and restaurants, including Florida’s first Paula Deen’s Family Kitchen and Southern Living Store. The award-winning line up of stores and restaurants include national & locally owned favorites, AMC Movie Theater, and Uncle Buck’s Fishbowl, an underwater themed bowling alley. Enjoy our renovated play area, mural art walk & seasonal events for nonstop fun year-round. There truly is something for everyone! Follow us on Facebook & Instagram and subscribe at www.DestinCommons.com for news on Gulf Coast Burger Co., Another Broken Egg, Torrid and Ridemakerz coming soon in 2019!